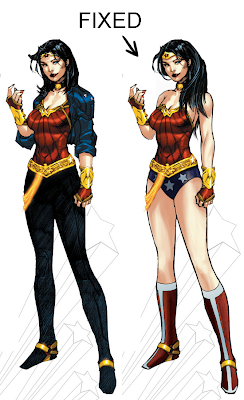 My husband seems to have accidentally achieved nationwide fame for a day for his "fix" of the immortal Jim Lee's somewhat disappointing Wonder Woman redesign. It's even showing up in the news now: "Wonder Woman Updated, Then Fixed." How awesome is that, seriously?! I think we should all try redesigns of DC's favorite Amazon - I'd love to see the results! * With respect to Mr. Jim Lee, who is still rockin'.